The “Neue Klasse” 1500 of 1961 was the car that saved BMW. It was the first medium-sized car from a company who had previously had to choose between the tiny and impractical Isetta bubble cars in 300 or 600 forms or the extremely expensive “Baroque Angel” 2600 and 3200 sedans, which were at least 10 years out of date and looked it. The 700 was a serious small car, but it was very bare-bones. Major stockholders Herbert and Harald Quandt had been shown Alex von Falkenhausen’s 1500 sedan in 1959, and when the near-blind Herbert Quandt ran his hand along the Michelotti body he nodded his approval. The car was shown at the 1961 Frankfurt Auto Show and orders outpaced production for quite a while. The four-cylinder SOHC 1500 grew to 1600 cc and then 1800 cc in 1963 and 1964. 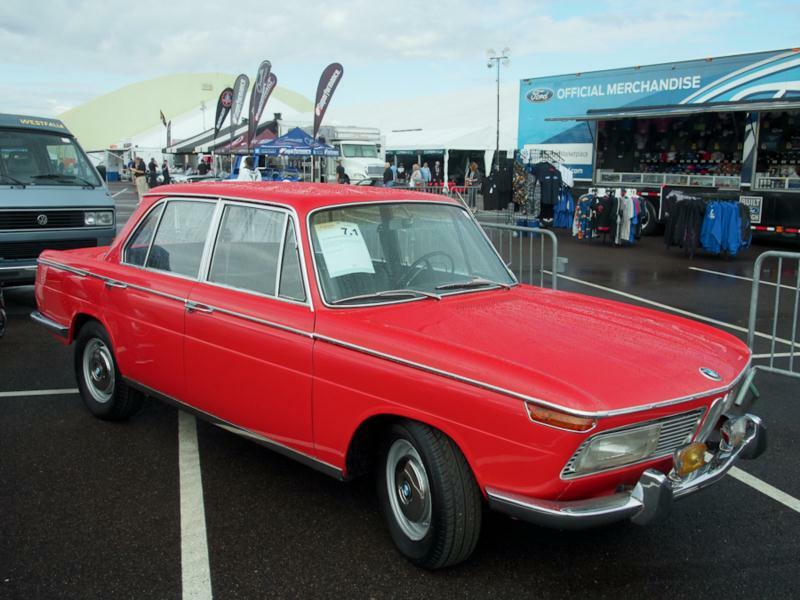 In the U.S., importer Max Hoffman wanted something lighter, faster and cheaper and in 1967 he would get his wish with the introduction of the two-door 1602, which was 500 lbs lighter and much more spartan. Meanwhile, both the four-door 1600 cc and the bigger 1800 cc sedans were good for 100 mph and the 1800ti (Touring International) got twin carburetors, boosting power to 110 bhp at 5,200 rpm. Top speed rose to 110 mph. There was even an 1800 ti/SA which was the competition version. You had to have a racing license to buy one, and it was good for 130 bhp at 6100 rpm and could do 120 mph. The 1800s were characterized by wood trim and leather upholstery, comparing quite favorably with the smaller Mercedes-Benzes of the day. The 1800 models were quite popular with 164,989 sold in eight years, though only 200 were the 1800ti/SA hot rod. These are correspondingly more expensive today if you can find one. Automatic transmissions were offered from 1966 and the original 1800 cc engine was replaced by an over-bored version of the 1600 in 1968, at which time the cars received dual circuit brakes. The final version of the original 1500 came along in 1966 in the form of the 2000/2000ti and 2000tii with the engine now stretched to 1990 cc. The plain 2000 had a single carburetor, the 120-bhp ti had two carbs and the 135-bhp tii was fitted with the Kugelfischer mechanical fuel injection that would turn the lighter 2002tii into a 130-mph barnstormer. The 2000tii was also lightened, though it’s comparatively porky against the 2002tii. The 2000 series can all be recognized by the stylized, elongated square headlights, which are difficult to find. None of these models was ever imported into the U.S., in which case they’d have been fitted with U.S.- made round headlights. These cars are old enough now that emissions won’t be an issue, but rust is very likely to be, and is quite often structural. The 2000 series was almost as popular as the 1800, with 155,655 sold from 1966-72, and dedicated BMW club members occasionally import them.